Students started organizing new parts into their respective bins. Most of these parts will be spares for competition. 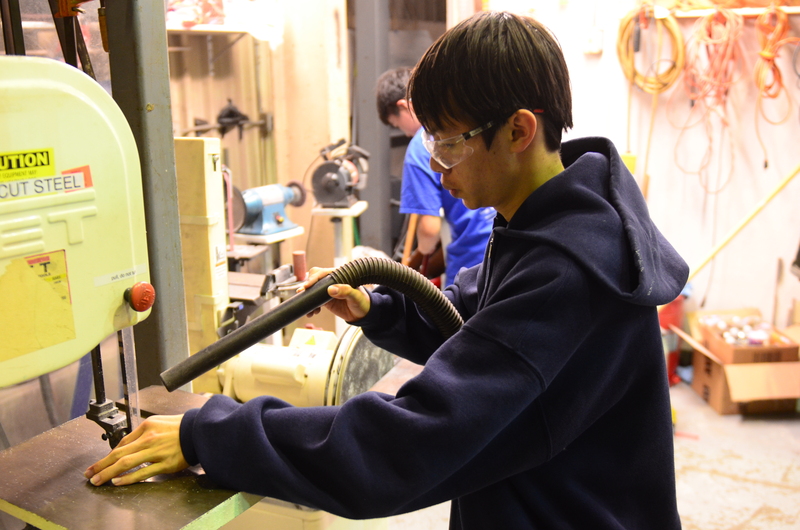 In addition, a few mentors and students worked on deburring, polishing, and touching up parts which will be sent in for powder coating and anodizing. Students contine to fix the drivetrain. A dog gear broke yet again. Students worked on taking apart the drivetrain gearbox to replace it. Students made new parts for the intake, including new mount side plates. 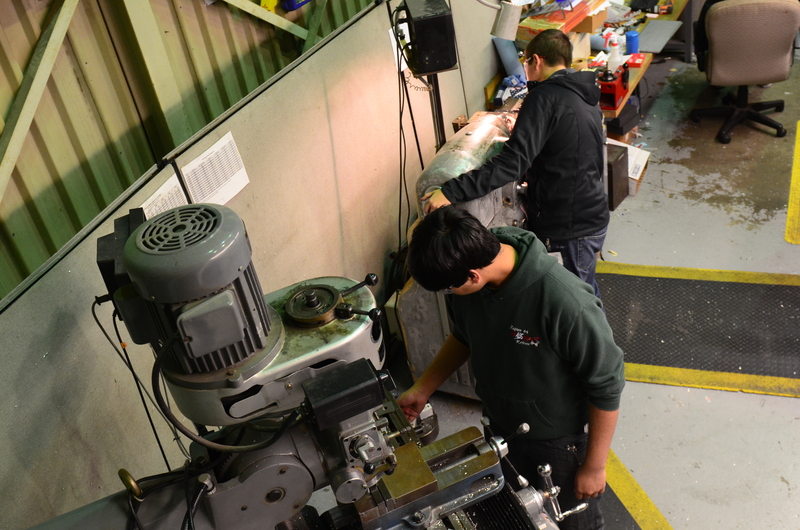 Additionally, students began assembling the intake support gearbox. 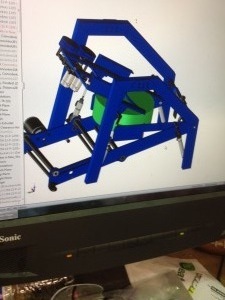 Students designed a one way valve in the shooter. This stop, made from a simple piece of bent polycarbonate, will allow the frisbee to leave the shooter in only one direction and prevent it from falling backwards. This stop is a simple mechanism to further eliminate possible jams that have plagued the robot for the better part of the season. 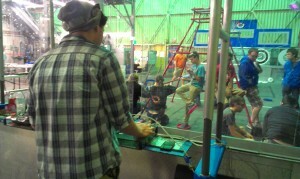 Teams 973 and 846 stopped by to the lab for practing and tuning in preparation for the World Championship next week. Students and mentors worked diligently to replace one of the intake rollers with a BBD. Students also worked to troubleshoot an issue with the new intake hardstop that was causing hang-ups on the intake system. Working diligently to manufacture new intake gearbox plates to save weight, students cut stock metal to be milled in the CNC. Wooden blocks were added tonight to the practice robot to keep the polycarbonate base of the intake from touching the ground. This is one of a series of adjustments to the intake to make it more efficient, fluid, and functional. The polycarbonate base often gets caught in the carbonate causing jams and reduced mobility. Overkill with all of the tanks. Even though the Frisbee hard stop was working last night, it was not today with the pin having trouble sliding the stopping plate up and down. This was solved by changing the hard stop to delrin and maintaining the mounting plates to aluminum. Also, students and mentors created two cross bars for the indexer. They also worked on shooter wheel mounting plates. Lastly, the team added temporary air tanks to the practice robot to allow for more shooting cycles and less refilling. 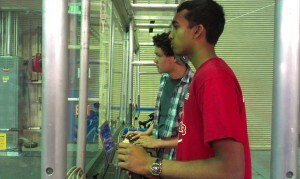 Abhi and Jonathan Lee continued driver practice in preparation for the upcoming competition. Students and mentors tested hall effect sensors using Slipstream as a power source, because of drivers using Overkill to practice. The hall effect sensors would detect the presence of a magnetic field. When magnets are placed on the indexer mechanism, a feedback mechanism is created to determine whether or not the indexer mechanism is completely engaged in the correct position. On the programming side, programmers fine tuned various code for indexing and shooting. Today, students built a pallet to ship large items to St. Louis. They packed some very crucial items needed for Championship, including the robot cart, pit shelving, batteries, and lights for the trussing. 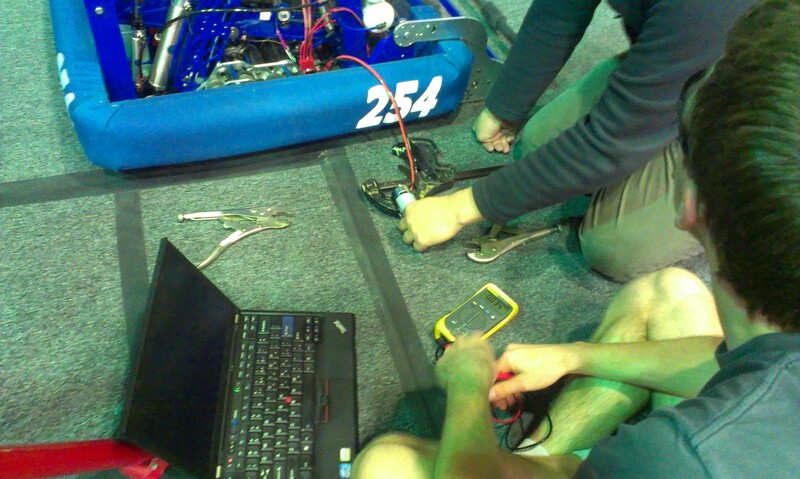 Lastly, programmers debugged some issues with the pit lights. The color effects no longer spawn new processes and overlap each other. Although pit lights are not a priority at the moment, students are making strong effort to make these functional to give the best appearance at the Championship event. 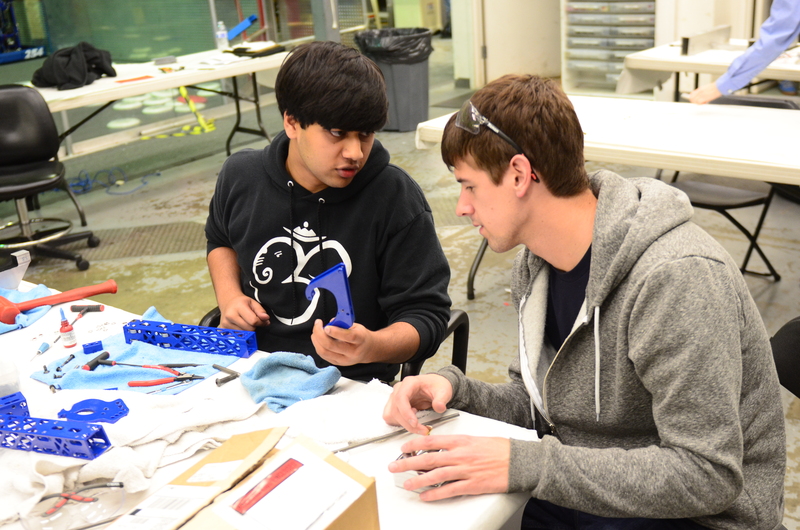 Today, students and mentors worked together to design new subsystems of the robot. For instance, a new gearbox was designed for the intake lowering and raising, which would replace the current VEX planetary gearbox. The VEX planetary was very inefficient and quite heavy. The new gearbox with its motor will be marginally heavier than the previous setup, and it has the benefit of a more favorable gear reduction. After the design work was completed and verified, the team went online to sites like AndyMark and McMaster to order these new necessary parts. It is essential that these parts are ordered and arrive quickly, as time is running out before World Championships. 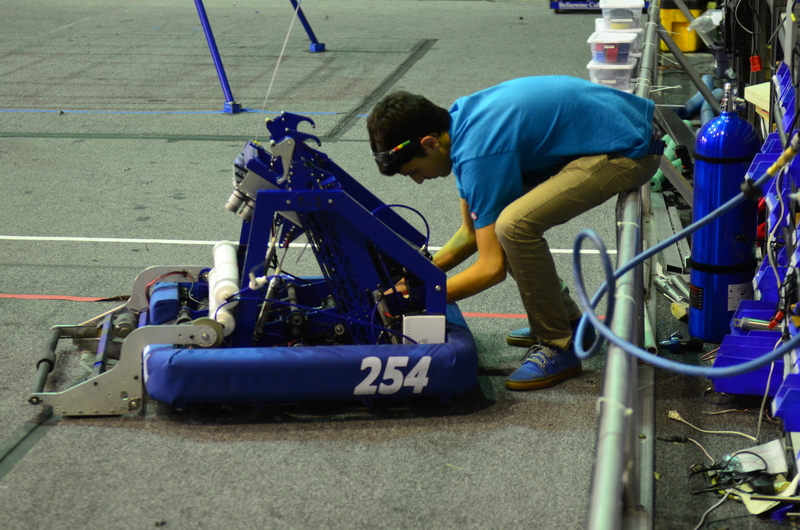 The team is scrambling to find places to trim weight on the robot. The new shooter wheels and intake gearbox are adding some weight to the robot, so the team trimmed some fat by removing the side panels, removing the pressure gauge support plate, and other areas. The 1/16″ side panels will eventually be replaced by side panels made of 1/32″ polycarb. Together, all the weight reductions will put us under weight. Although we are cutting it very close, we will eventually get to where we want to be. 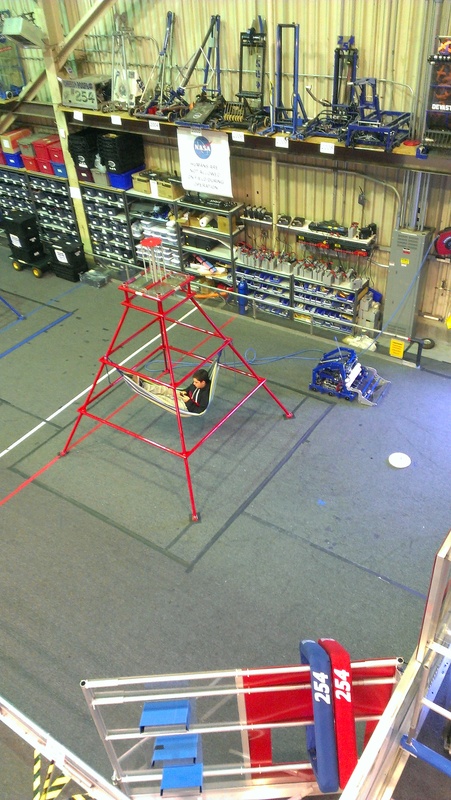 The programmers experimented with VEX bumper sensors as a means of detecting whether or not the frisbee is fully loaded in the indexer, and thus ready to transfer up to the shooter. They attached two bumper sensors via double stick tape on either side of the hard-stop plate. The next step of this is to wire the sensors to the digital sidecar and write up some codes. When completed, the bump sensors will allow for increased speed of rapid fire. Tests will determine the reliability and durability of this setup to ensure it can survive the stresses of competition. Students worked to carefully repair the intake when it broke this morning. They had to pause momentarily to remove the intake and fix it on the side. Due to the fact that there are only two weeks remaining before World Championships in St. Louis, a lot of the team’s new redesign ideas needed to be reconsidered realistically. While the progress of designing a bucket indexer seemed promising for spectacular scoring, it needed to be put on hold so that the team could focus on other important design tasks. In addition, it would require a major redesign or would bring up weight issues easily. The team decided to refine and work out the issues it currently has. The benefits of the major redesigns are not worth their risks, and it will be a much better use of time to work out the small issues the robot currently has. Currently, the team is using Solidworks to design a new intake gearbox that would not make the motor burn out as quickly as the Banebot motor does now. In addition, the new gearbox will eliminate a VEX planetary from the robot. Another important task includes making indexer hard-stop mechanism to prevent frisbees from jamming and stacking inside the indexer. This addition is a major improvement that is a top priority. This hard stop needs to be simple, passive, and reliable. Most likely, the stop will be mounded to the conveyor side plates. The stop itself will be lowered as the indexer mechanism is lowered. As the indexer is raised, so will the hard stop to forbid the frisbee from moving forward. 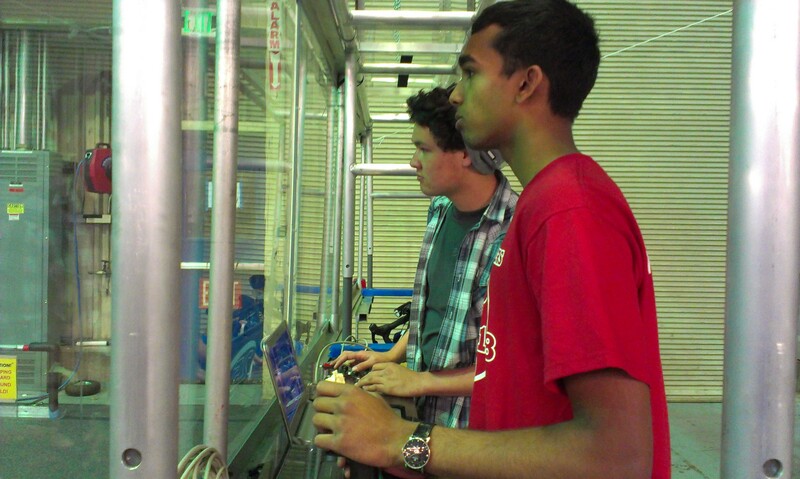 Abhi Kumar and Jonathan Lee practiced driving the robot around to improve positioning consistently and prepare for competition scenarios. Students finally finished unpacking from SVR. All of the competition crates were unpacked and bins were restored to their original places. The lab is now fully equipped and ready for robot iterations and improvements. A modified design with the green cylinder representing the bucket. The bucket design was worked on today in great detail. Parts from the indexer, shooter, and conveyor were changed in CAD today. The conveyor side plates were shortened to reduce weight and accomodate the large bucket. 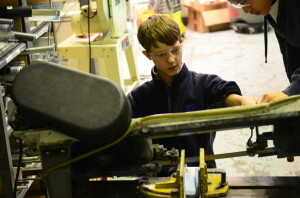 The indexer side plates(butcher knives) were made longer to account for the buckets new position in the robot. Finally changes were made to the shooter parts to accomodate the width of the buckets and frisbees that currently fit from wall to wall of the insides of the hanger. These design changes are still being considered and evaluated. Brogrammers know what was done. Students started today’s build session with a general clean up after dinner, including a full cleanup of the upstairs area and a more specific unpacking. After the cleanup, investigation on the buckets continued, and it was learned that if a bar applies pressure on the bucket in the part nearest to the conveyor, a system is created which prevents upside down frisbees from joining the stack. However, this only works if the first disc is intaked right side up. Furthermore, work was done on a system which gets discs from the human player. 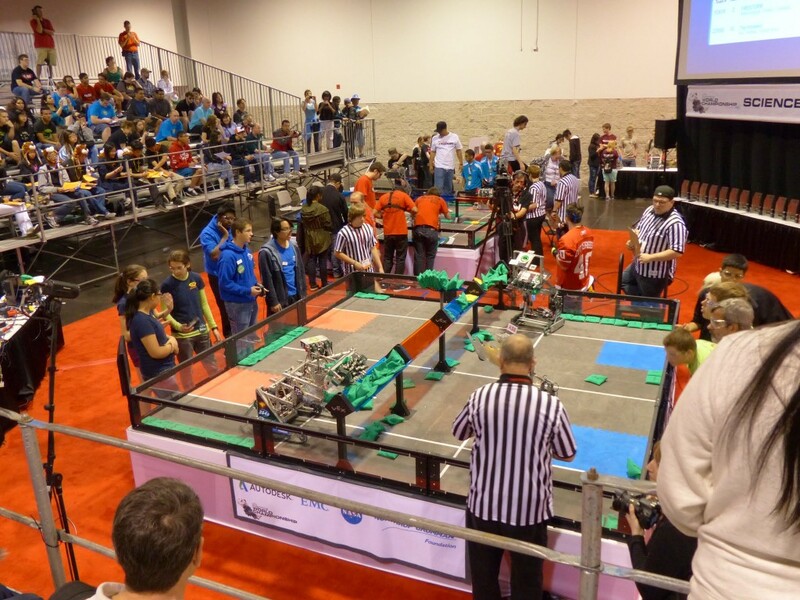 The programmers worked on a couple of classes which allow for certain buttons to take effect, even when the robot is disabled. These buttons include ones which reset the gyros in the robot and select autonomous code. In addition, there were minor refactorizations of the code. The team members helped unload the many items into the lab that were brought to the Silicon Valley Regional, such as the black crates, the robot, the bumpers, tool chest, robot cart, and carpets. After most of the luggage was placed on the field, students helped move the large rolls of carpet into the sheltered area outside. This carpet will replace the current carpet on the field because it is getting torn. After unloading from the truck, students helped pack necessary items into a giant, wooden 254 crate that will be shipped to St. Louis, MO in time for the FRC World Championships. They helped by loading in the robot, bumpers, tool chest, trussing, pit lighting, foam tiles, sunglasses, and other important items. The giant crate is all sealed up and ready to ship. The team is looking into some pretty significant redesigns of certain subsystems of the robot in preparation for World’s. They purchased a 5-gallon white bucket and cut off the top portion, placing it in place of the practice robot’s indexer. After securing it into position with tape, the students tested the bucket “magazine” system by intaking and exhausting frisbees, which worked much better than expected. The discs glide cleanly under the bucket to form the four-disc stack. This approach will allow the robot to accept discs directly from the feeder station, while allowing for rapid shooting and less potential for jamming (hopefully). 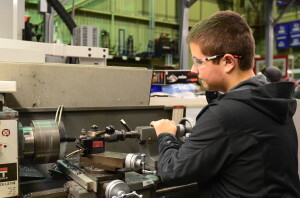 While we are heavily weighing the implications of such a major design change, students are preparing designs and prototypes to accurately measure the risks involved. We also enjoyed some delicious chocolate cake, made by the one and only Esteban Parker. Today was an eventful day to say the least. 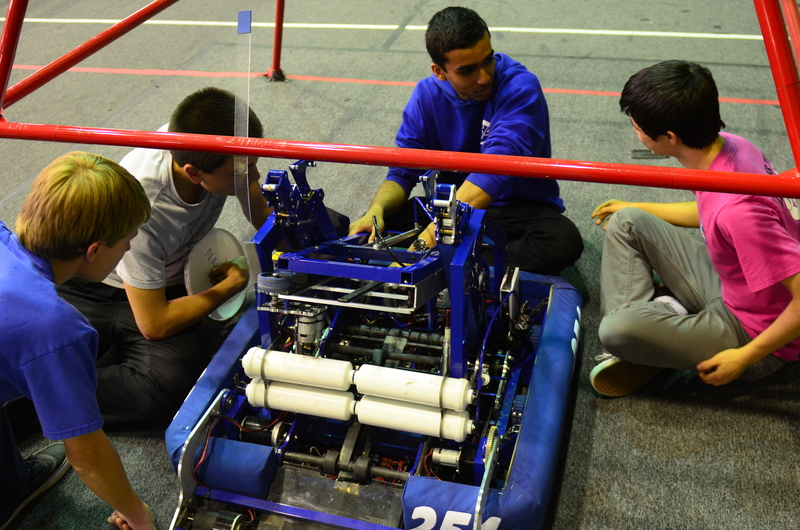 The team worked hard to finish the necessary tasks before SVR including packing, calibrations, and assembly of subsystems for the competition robot. 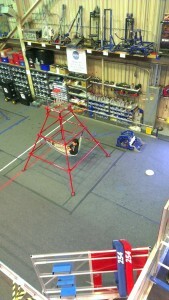 A new hanger was assembled for the comp bot as well. Programmers worked primarily on the hanger today, using gyros on the robot to calibrate the hang and make the autonomous work accordingly. After hours of testing and calibrations the programmers were fine tuning the timing of the hang phases. 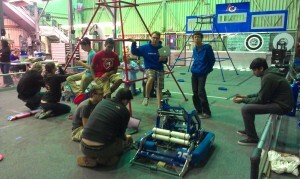 The drive team practiced with the robot today, in order to get ready for SVR and practice getting setup for hanging. However, unfortunately while practicing hanging, the robot dramatically fell off the top of the pyramid and consequently suffered some damage; a belt on one of the hangers broke. 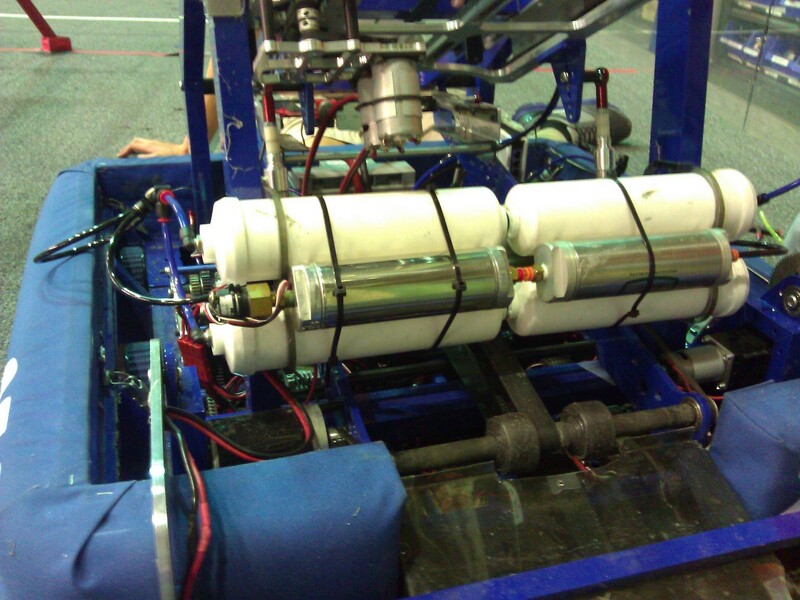 Since we do not have enough spare belts we cannot fix the practice bot hangers until after SVR. On another note, the students replaced the banebots wheels on the shooter with a polyurethane wheel to test if it significantly improved results. However, this new wheel did not seem to improve the robot’s shooter. After SVR, the team will look for other options for wheels. Today students recieved the powder coated hanger and intake parts, and worked on assembly drive gearboxes and hanger mechanisms to bring to SVR and equip on the competition robot. 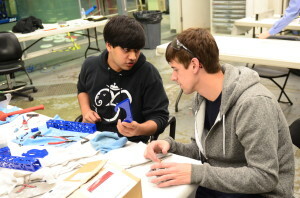 Afterwards, students worked on making polycarb flaps for the loading mechanism on the robot. Students began to pack items needed for competition at SVR including the toolchest, and part bins. The clear part bins were packed intro crates 5, 2, & 3. Additionally, boxes 8 and 4 were consolidated into one, and box 1 was packed with important programming parts and tools. Finally box 7 was packed with small clear boxes of parts.  Today the lab was opened for Teams 4543 (Apollo High School) and Team 971 to use our field for calibration and driver practice, while working on bugs in preperation for SVR (where both robots will be competing). Today Driver Abhi Kumar, and Operators Chris Sides and Scotty Cardona all practiced on the field, specifically picking up discs from the area around the pyramid and shooting into the high goal from the pyramid. The robot was about 76% accurate (data taken by scouts). We hope to improve accuracy to over 90% before SVR. One of the main points of improvements are the BaneBot shooter wheels that need replacing. 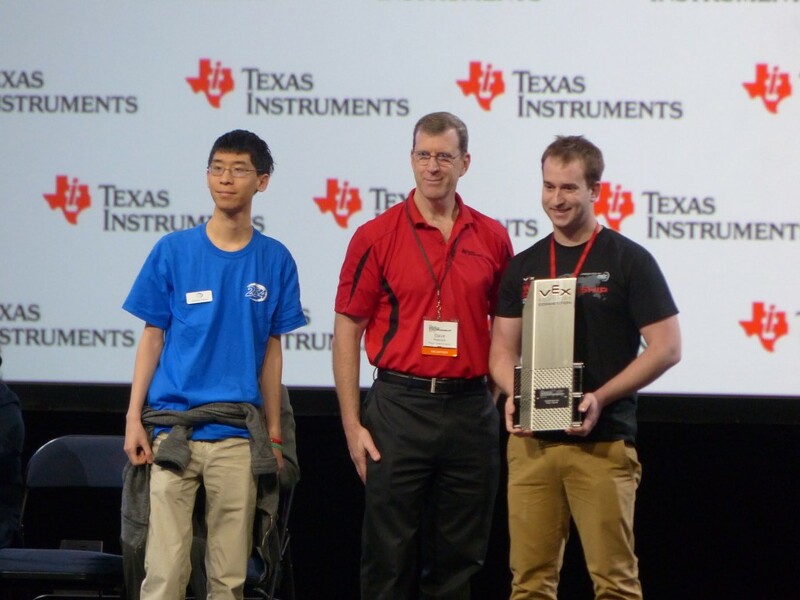 Today students took many major steps in preparation to present the Chairman’s Award at SVR. One aspect of this work was the development of the the team binder, with students formatting the various pages of the binder. Additionally the presenters (Richard Lin, Alex Powers, and Nagy Hakim) prepared for the judges interview, working on the power point and the question and answer section. Students constructed beam sensor mounts for the robot. These beam sensors will be used to determine whether or not a disc has reached the back of the conveyor to be properly indexed. Furthermore, the development of the hanger continued, with elevator belts being tensioned, and manufacturing shafts for the belt. 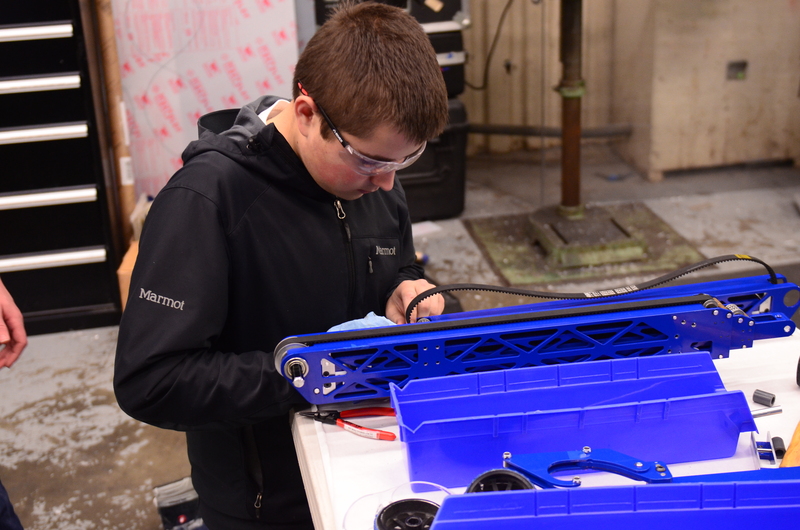 Two of the three new hangers are ready to be attached to the competition bot, with the third functioning as a spare to be put on either side; due to this orientability, it will not be fully assembled until it is attached. Lab closing time was: very late.